Brasserie 8 ½’s grand, spiral staircase leads to an elegant dining room, and a sleek restaurant bar where one can enjoy a pre-dinner cocktail. 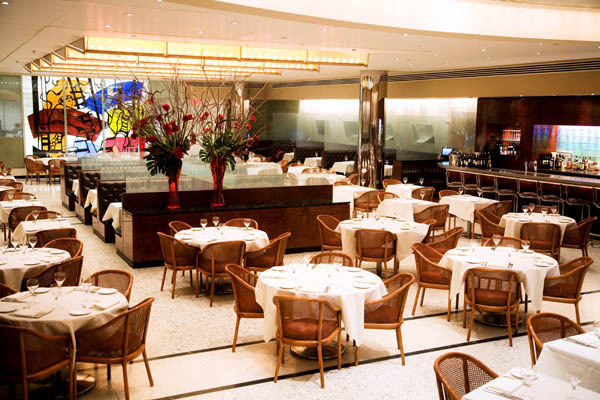 This upscale French bistro is located in the heart of Midtown Manhattan just steps from Fifth Avenue on 57th Street and features an exquisite selection of original artworks. 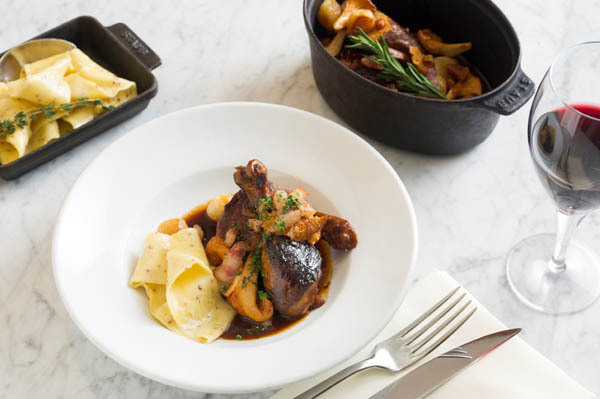 Executive Chef Franck Deletrain, noted for his sophisticated French cuisine, has crafted the menu which shows a light and refined take on classic French dishes. Chef Deletrain has extensive experience working in Manhattan restaurants, including The Four Seasons, The Sea Grill, Tropica, Café Centro, and Patroon, where he earned three stars from The New York Times. Parisian-born, Italian-raised Chef Deletrain and his skilled team prepare specialty dishes including appetizers such as Grilled Octopus with Brussels Sprouts, Grapes, Butter Beans, Espelette Pepper; Lobster Risotto with Sweet Peas, Tomatoes, Black Truffle Essence; and Onion Soup Gratinée with Emmenthaler and Gruyère Cheese. Delicious entrees include the Duck Two Ways, served with Roasted and Confit, Poached Quince, Braised Red Cabbage, Cranberries, Apple Cider Gastrique; Black Angus/Dry Aged Sirloin Steak Frites, served with Herb Butter, Au Poivre Sauce, or Béarnaise; and Yellowfin Tuna with Whipped Parsnips, Brussels Sprouts, Oyster Mushrooms and Burgundy Matelotte. Some of the expertly prepared desserts include the creamy Classic Crème Brûlée, the velvety Valrhona Chocolate Raspberry Mousse Cake, and the flavorful Black Plum Tartelette with Almond Frangipane, Vanilla Ice cream and Ginger Syrup. The restaurant also offers a selection of French, Italian and American cheeses, including Tomme De Savoie from Rhone-Alpes, France; Robiola Bosina from Piemonte, Italy; and Cave Aged Humbolt Fog from Humboldt County, California. The restaurant also features a hand-crafted cocktail program with a focus on French libations. Specialty cocktails include the 8 1/2 Cosmopolitan, featuring Absolut Citron, Cointreau, Aperol, Lime, Splash of White Cranberry; the La Mode Ancienne, featuring Rye Whiskey, Pierre Ferrand Dry Curacao, Angostura; and the Berry Gin And Tonic, featuring Pinnacle Gin, Blueberry & Raspberry Purées, St. Germain and Tonic. The restaurant also offers an extensive wine list with wines from all over the world. On the weekends, try Brasserie 8 ½’s Sunday Brunch Buffet, featuring a range of delectable favorites, including crêpes, omelets, salads, as well as carving and pastry stations – all priced at just $34 per person ($17 for children under 10). Diners can opt to add Endless Mimosas during brunch for just $14 extra. Sunday and Monday are BYOB Nights, and diners are welcome to sip their own wine with no corkage fee, while enjoying supper. For weeknights and after-work gatherings, stop by for Oyster Happy Hour at 4:30pm – 7:30pm, Monday – Friday, when the restaurant offers raw oysters on the half-shell for just $1 per oyster. Aspiring home cooks can sign up for one of the L’Atelier de 8 ½ cooking classes. In this new cooking series, Chef Deletrain teaches attendees how to whisk, toss, sauté, and glaze their way through the dishes that make French food so delicious. After having mastered a menu of French classics, these are enjoyed over lunch together with a selection of French wines. Classes are limited to 12 people in order to keep it an easy, fun, and hands-on workshop. Original artwork by artists such as Matisse, Marco Del Re and Léger furnish Brasserie 8 ½. The restaurant is a stylish embodiment of a bustling French brasserie, offering a sophisticated dining room fit with ivory tablecloths. The curved bar and lounge serve as a popular after-work spot for business locals and destination diners alike. The restaurant also includes a number of private dining rooms, which can be configured for dinner parties as well as standing cocktail receptions. Original artworks decorate the walls of the rooms, among them an original Marco Del Re painting.